It was important for the lighting design to reinforce the relationship at night between the interior and exterior spaces through the transparent glazed perimeter which provided the architectural backdrop to the courtyard. The underside of the external canopy was uplit from recessed flush mounted uplights, located behind the supporting timber columns, which were in turn downlit from close offset fixtures. 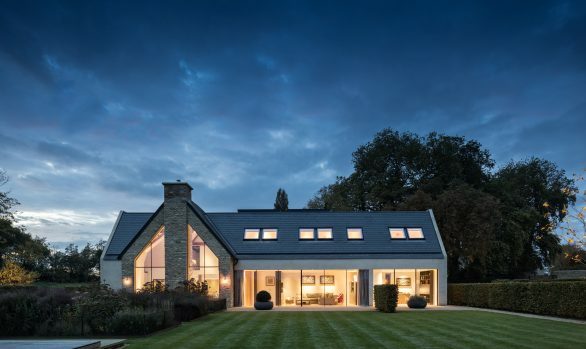 The combination of these two lighting elements provided a sense of rhythm to the building exterior and produced an atmospheric statement on entry to this beautiful Oxfordshire dwelling. The interior lighting was produced by a palette of recessed and track mounted downlighting, floor uplighting, integrated and concealed lighting within furniture and a splash of decorative lighting. The integration of a wireless radio controlled lighting control system, made the best of the various lighting layers within the project.